First Holy Crusade. He led his army through northern Italy to recruit soldiers. The soldiers from the Ligure province, specifically from the Vara Superiore region, fought with lances, not swords. They were called Lanciada, for lance carriers. These soldiers fought in Syria. The best were raised to the stature of the nobility. These few took the name “Siri” from Syria. 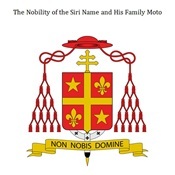 When Giuseppe Siri was raised to the Episcopacy, he chose his family crest, along with its inscription, for his own. In 1977, Franco Bellegrandi, ex-Chamberlain of the Cape and the Sword of His Holiness and contributor to L’Osservatore Romano, wrote a book titled, NikitaRoncalli, which was published in 1994, accompanied by quite a commotion in the national press at its release because, among the persons present was Cardinal Silvio Oddi. "Gregory XVII's ("Siri") Public Castigations of V2 Sect Antipopes"
"Gregory XVII Defends Papal Jurisdiction Against Usurpers"
Lord, make an end of this present situation already. I can't stand it anymore.